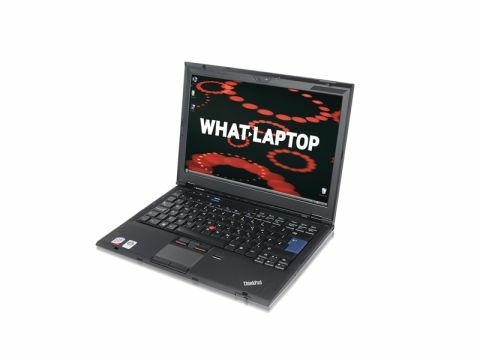 Lenovo's ThinkPad range is aimed at business users and the X300 (£2139 inc. VAT) is the latest flagship model for the mobile professional. This ultraportable laptop comes with a built-in optical drive, good-sized keyboard and, more importantly, a battery life that actually meets the needs of the mobile worker. Weighing 1.6kg, this is as portable a machine as you can expect from a two-spindle chassis. It has an overall depth of 28mm, which considering you'll find a DVD rewriter built into the case as standard is something of an impressive feat. The build quality is excellent, with plenty of protection behind the 13.3-inch screen. The main body is magnesium alloy with what feels like a rubberised coating to give it a more tactile feel. Overall, this feels like a machine that can take a great deal of daily punishment and survive. The panel is a standard TFT screen, which causes fewer reflections when used on the move, and we found it had a wide brightness range, dimming considerably when on battery power. However, what really makes this machine a pleasure to use is the keyboard. Filling the width of the main board, the keys are a good size and have plenty of space. The keystroke travel is smooth and we found it great to use for long periods. When it comes to performance, this isn't the most powerful machine, as compromises have had to be made. That said, using the Intel 1.2GHz Core 2 Duo U7600, it's quick enough for the daily routine. Lenovo has also opted to use a 64GB SSD drive, so the disk has no physical moving parts. However, it's the little touches that make this a great machine, such as the firmly fitting power supply and mini-power brick that make it easier to take on the road. 3G is also built in, but you'll need to tie in your contract with Vodafone, as this is currently the only provider supported. Ports on the side of the machine are kept to a minimum. You won't find an ExpressCard slot, for instance, and the ports you will find have a certain legacy to them. If this were a consumer model you'd expect HDMI, but with only a VGA-out port for connecting to external devices, this is clearly a business tool. With this in mind, you'll find a biometric fingerprint scanner on the palm rest and even the use of Intel's vPro professor, which is designed to make managing devices remotely easier. The Lenovo ThinkPad X300 isn't so much a grand reinvention of the company's ultraportable, but more a streamlining. True, it's not the most powerful of machines, but the sheer usability makes it an impressive laptop.